The Republic of Guinea is located in West Africa with an Atlantic coastline. 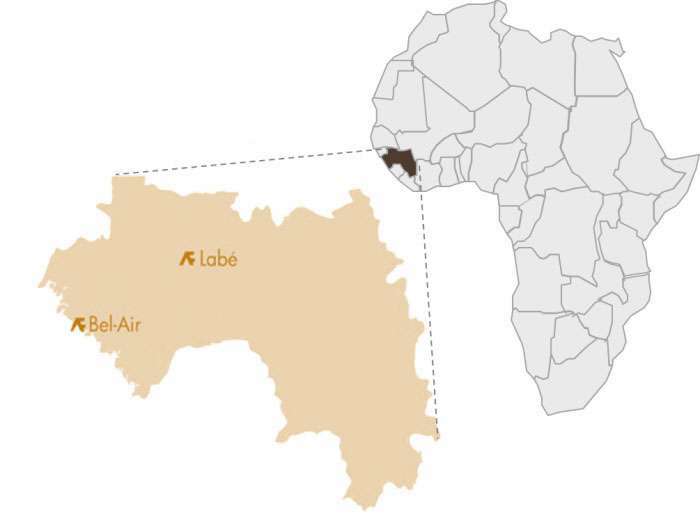 It borders Guinea-Bissau, Senegal and Mali to the north; Sierra Leone, Liberia and Côte d’Ivoire to the south. Mining accounts for over 70% of the country’s exports. Several ‘majors’ present in country. Deposits of bauxite, iron ore, gold and diamonds with significant geological potential. Country accounts for c. 27% of global bauxite reserves (Source: The Bauxite Index). Guinea’s first democratic presidential elections were held in November 2010 and parliamentary elections were held in September 2013. Guinea subsequently received increased support from global institutions including the United Nations, the World Bank, the IMF and the EU. He was inaugurated for a second five term on the 14th December 2015, is focused on creating economic wealth for the country and encourages foreign investment within this context. Final amendments to the ‘new’ code were promulgated in April 2013. Government right to 15% non-dilutable free-carried interest and to acquire up to a further 20% interest for cash. These are maximum levels of Government participation – final terms in every case to be negotiated individually in a Mining Agreement between the Government and the mining company and will include royalties, tax rate, tax holidays etc.